Do you need reliable backflow preventer testing in the Maryland/Virginia/DC area? Call the professionals at R.V. Carey’s. In addition to annual backflow preventer testing, we also provide backflow preventer installation, repair, and replacement. For backflow preventer services in Maryland, Virginia, or Washington, DC, including testing, installation, repair, and replacement, call R.V. Carey’s today at 301-424-8899 or contact us online to learn more. Backflow preventers are devices used to prevent sudden drops in pressure from allowing polluted water to back up into your pipes and contaminate potable water supplies in your facility, making people sick. Building owners, particularly owners of businesses, restaurants, and other commercial facilities, are responsible for maintaining backflow preventers via annual testing and rebuilding or replacement when necessary. The Washington Suburban Sanitary Commission (WSSC) as well as other authorities having jurisdiction (AHJs) require annual testing of backflow prevention devices and cross connections by a licensed plumbing company. The licensed plumbers at R.V. Carey’s have the training and experience necessary to help you meet your municipal requirements. 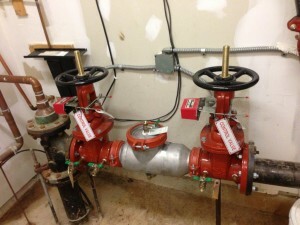 Where Should Backflow Preventers be Installed? R.V. Carey’s can provide backflow preventer testing, repair, installation, and maintenance that fits your schedule. We are a fully licensed and certified plumbing company located in Rockville, Maryland and we serve homes and businesses throughout Maryland, Virginia, and Washington, DC. Having your backflow preventer tested annually will help keep the drinking water in your facility safe. R.V. Carey’s has the experience to manage any and all backflow certification, testing, and repairs you may need. If you need backflow preventer testing, installation, repair, or replacement in Maryland, Virginia, or Washington, DC, call R.V. Carey’s today at 301-424-8899 or click here. Why Call R.V. Carey’s for Backflow Preventer Services? Learn more about our new construction plumbing services. When you need backflow preventer testing or other services in Maryland, Virginia or Washington, DC, call 301-424-8899 or contact us online!